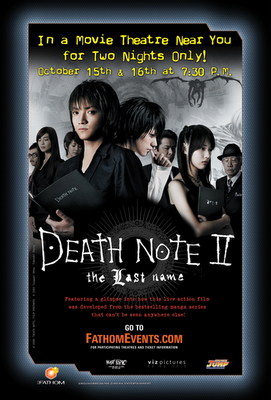 Death Note II: the Last Name Ticket Contest! Hey, US otaku! I have some great news for you. Here at Chuck's Anime Shrine, I've been given the honor to award a few of my blog readers , Free Death Note Movie II Tickets! That's right, Chuck's Anime Shrine (me) along with Fathom Events and Ignite Social Media, the companies that are bringing the movie to America, are proud to award people who comment on my blog this offer. This is obviously for US readers only and for people who can make it to the showing on the 15th & 16th. Like the first movie, this one is in select theaters only so here is a list of them for your reference. The rules are simple, just make relevant comments on any of my blog posts here and you might be randomly chosen. Me and Fathom Events and Ignite Social Media need to be able to contact you so please try not to leave anonymous comments. Be sure to use a Live ID or blogger account that has some sort of access to your email or simple leave it there on your comment. The contest ends Oct 1 st, so get commenting! More info on the movie here.